Dublin City Council has released the first snapshot of traffic management works needed for Luas Broombridge construction, and, so-far, it seems like good news for cyclists. The works relate to St Stephen’s Green South, an area that is outside the remit of the An Bord Pleanala approval for Luas BXD, so it is subjected to part 8 planning approval by the city council. It is proposed to provide a new 1.75m wide cycle lanes on both sides of east of the green. The lane on park side will continue northbound, and the council says “It is intended that this link will be extended to College Green.” A cycle lane is for the first time included inside the southbound contra-flow bus lane. It is proposed to relocate the existing Dublinbikes bike station on St Stephen’s Green East north of the St Stephen’s Green East / Hume Street junction. The relocation of the bike station is required due to the removal of the existing pedestrian crossing on St Stephen’s Green East and to coincide with the proposed signalisation of the St Stephen’s Green East / Hume Street junction which will provide a safe crossing system for cyclists to access the new location of the bike station. An additional 10 docking spaces will be facilitated immediately south of the pedestrian crossing. 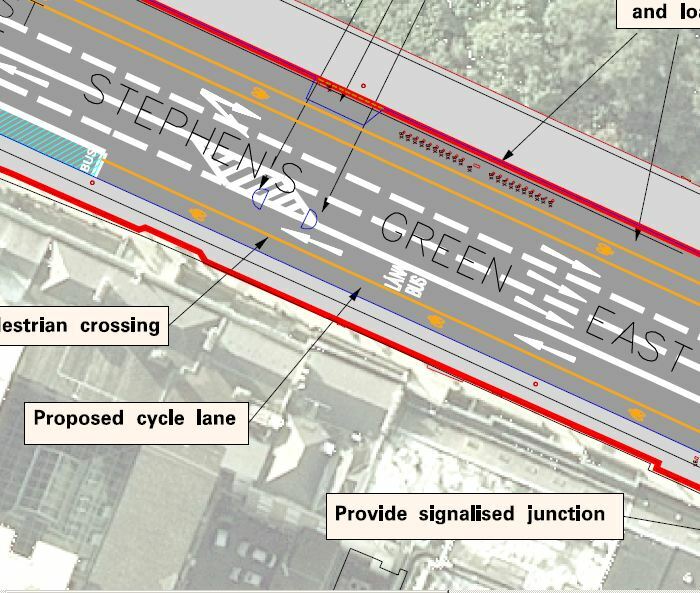 New cycle tracks will be provided along St. Stephen’s Green East to link St Stephen’s Green North. It is intended that this link will be extended to College Green. The removal of existing build out at the junction of St. Stephen’s Green East, St. Stephen’s Green North and Merrion Row will result in the loss of existing cycle parking spaces on the build out. It is therefore proposed to provide additional cycle parking on Hume Street, adjacent to the existing cycle parking. It should be noted that this may result in the removal of car parking spaces. In addition it is proposed to provide 4no Sheffield stands outside the Shelbourne Hotel, in this regard, 2no stands on either side of the loading bay. Looks good so far,so long as they dont make a Hames of it. Like to see them put more Bike Parking outside the Shelbourne instead of just four measley Parking Stands. The extended cycle lanes going around the corners of St. Stephens Green South & North need to be segregated from the main flow of traffic surely? Otherwise there is the potential for dangerous conflict with fast left turning traffic? Maybe something like the flexible bollard segregation provided on O’Connell Street Lower could be used?